2008 was a great year for the bedroom star. The continued rise of the computer rock god saw fans everywhere complaining of plastic axe-finger. 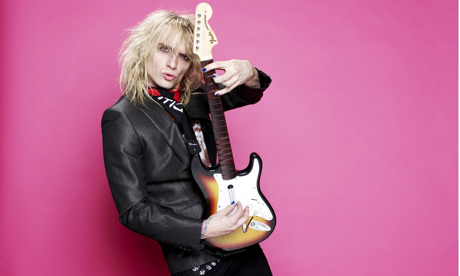 For the December issue of Observer Music Monthly we called in ex-Darkness singer and Hot Legs frontman Justin Hawkins to test out Rock Band 2, and we have a Rock Band 2 Standalone Guitar controller signed by the flamboyant fretman to be won. Rock Band 2 is available now on Xbox 360. Closing date: midday Friday 9 January 2009.